1. Solvent cleaning and Abrasive Blasting of steel surface should produce clean surface free of oxidation in preparation for the Anti Corrosive Coating Application. 2. Thorough mixing of parts A and B for application by brush, roller or spray. 4. 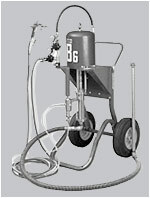 Spray: Conventional Spray Application: Use pressure fed spray gun – DeVilbiss JGA558, AV651-D fluid tip, MB-4039-64 air cap set up, or equivalent with 75 psi atomising pressure and air agitated pot pressure of 20 psi, according to length of material line used. Airless Spray Application: Use pneumatic airless pump such as Binks B6 or B8 confirmed by manufacturer as suitable for waterborne inorganic zinc. Use a 0.017 – 0.021” tip with a 2500 psi atomizing pressure.